Buttery, melt in your mouth shortbread cookies infused with peppermint then dipped in chocolate and sprinkled with crushed candy canes. 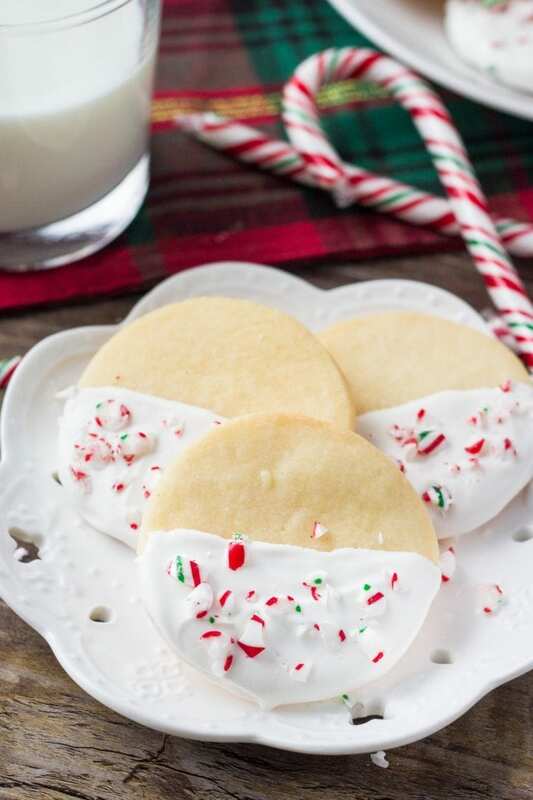 These white chocolate peppermint shortbread cookies are perfect for Christmas! Every Christmas my aunt makes incredible whipped shortbread cookies. 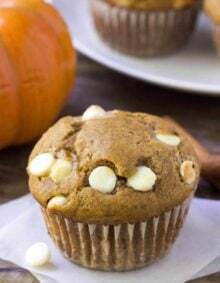 They melt in your mouth and are perfectly buttery in the most delicious way. So this Christmas, I wanted to make my own shortbread cookies. But I wanted them to be a little different, since I know we’ve already got traditional shortbread covered. 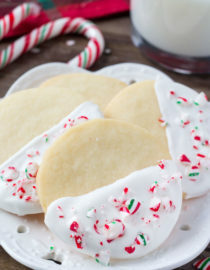 That’s where the idea for these white chocolate peppermint shortbread cookies came in. They’re soft, buttery shortbread cookies. Then we’re adding a little peppermint extract to the cookie dough. After they’re done baking they’re dipped in white chocolate and sprinkled with candy cane pieces for the perfect holiday cookie. 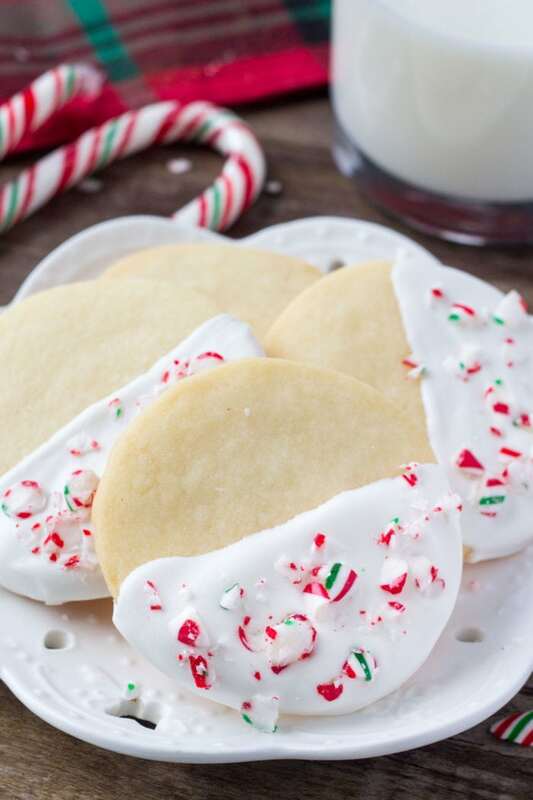 The combination of peppermint candy canes, white chocolate and shortbread is perfect for the holidays. 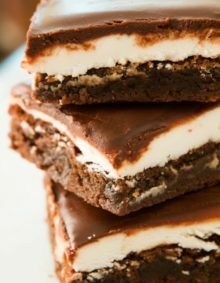 Plus – I think the white chocolate dip makes them extra pretty. Shortbread cookies are absolutely delicious, but there’s a few key tips for perfect cookies. Start with good quality butter. Since butter is the main flavor in shortbread, using margarine just doesn’t cut it. Have your butter room temperature before getting started. This makes it easier to work with. Some recipes call for cold butter in shortbread instead. Then it’s either grated in or mixed in using a food processor. I prefer the texture when the butter is softened first, plus it makes for easier mixing. Sift the flour first to ensure there’s no lumps in your cookie dough. Adding a little cornstarch creates a softer, more tender consistency. Be careful not to over mix the dough – otherwise it can get tough. Roll out the dough on a well floured surface with a floured rolling pin to ensure the dough doesn’t stick. After cutting out the cookies, chill in the fridge for 10 minutes to avoid spreading. Bake at 325F so your cookies don’t get too crispy. 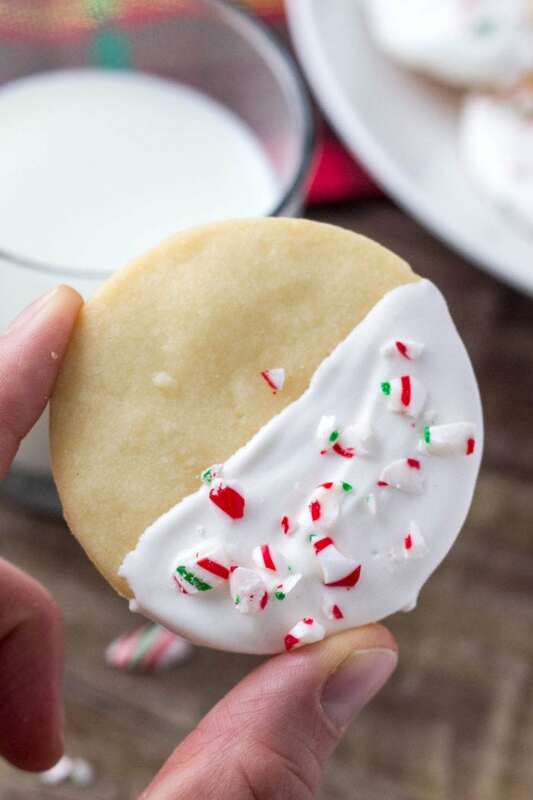 This list might look long – but I promise these white chocolate peppermint shortbread cookies are actually very easy to make. If you follow these steps you’ll end up with soft, buttery, melt in your mouth cookies every time. 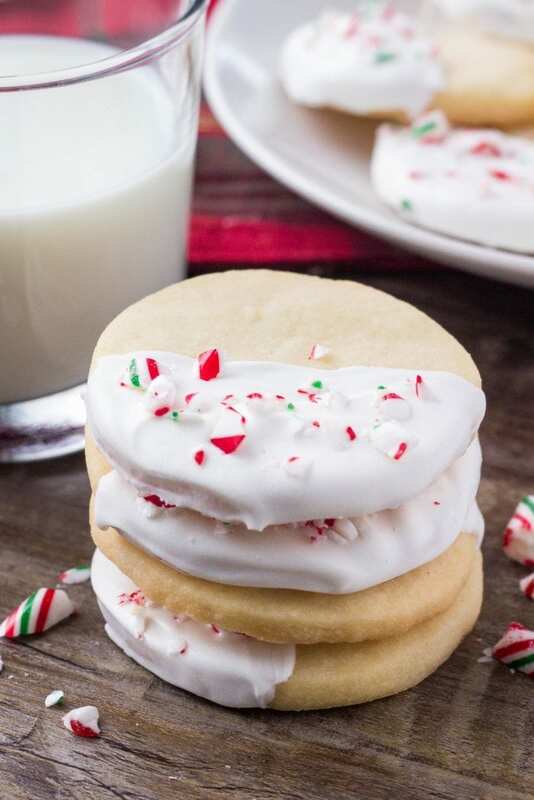 So if you’re looking for a delicious cookie that’s perfect for the holidays – these white chocolate peppermint shortbread cookies should definitely be on your list! Preheat the oven to 325F degrees. Line cookie sheets with parchment paper or silicone baking mats. Then beat in the powdered sugar, peppermint extract and vanilla extract. With the mixer on low speed carefully beat in the flour, cornstarch and salt. Then turn the mixer up to medium-high speed as the dry ingredients get incorporated. Divide the dough into 2 pieces, ensuring to incorporate all the flour from the bottom of the bowl. On a very well floured surface using a floured rolling pin, roll out 1 piece of the dough until it’s about 1/4 to 1/3 inch thick. Use a cookie cutter to cut into rounds, and place 1 inch apart on the prepared cookie sheet. Place in the fridge to chill for 10 minutes. 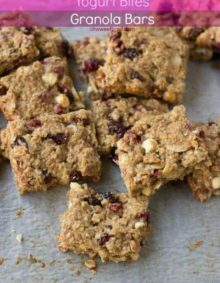 Bake the cookies 1 sheet at a time for 10-13 minutes, or until the tops are just golden. Watch carefully so the cookies don’t burn. Melt the chocolate in a small microwave safe bowl in 30 second increments, stirring between each. Dip half of each cookie in melted chocolate and sprinkle with crushed candy canes. Cookies store well in an airtight container at room temperature for 4 days. 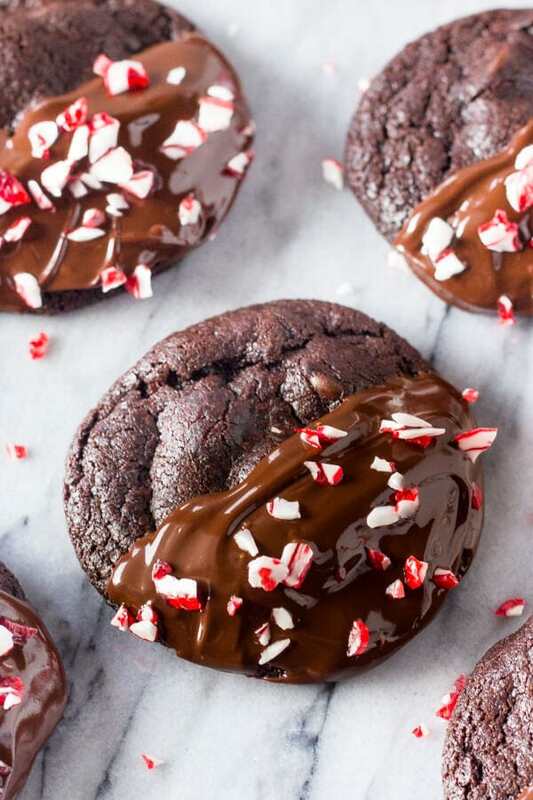 If you love candy canes and chocolate – then make sure to try these double chocolate peppermint cookies. Rich fudgy cookies dipped in chocolate and sprinkled with peppermint candy canes. 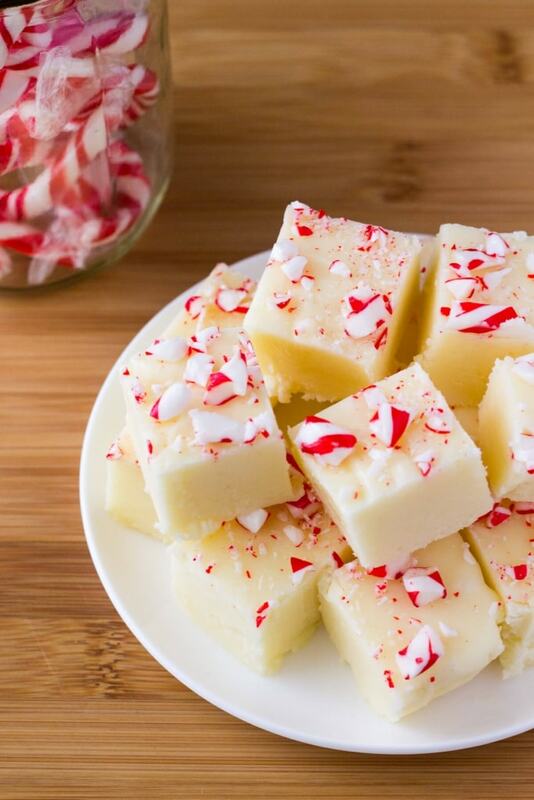 Creamy White Chocolate Peppermint Fudge. An easy white chocolate fudge recipe that’s infused with peppermint and sprinkled with crushed candy canes. 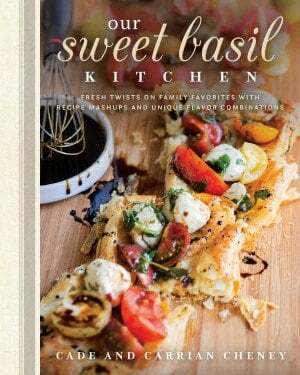 Makes a decadent, delicious gift! I have a friend that had throat cancer and is limited in what he can eat. He says he can only have food that is not crumbly and so soft that it “glides” down his throat. Would these work…minus the candy?